Muuto are striving to expand the Scandinavian design tradition with new and original perspectives. Muuto, inspired by the Finnish word muutos, means new perspective. To them good design starts with the person. By handpicking the brightest design talent in Scandinavia and giving them the freedom to express their individual story through everyday objects. Some want to alter the world, others find passion in colour and shape or draw deeply from personal experience. How do they see a chair, vase, lamp or any other everyday product? You will know their design because it has muutos. Objects made sublime through new perspectives, enjoyed across the world, representing the best of Scandinavian design today. “New perspectives on Scandinavian design” - Based in Denmark, Muuto’s traditional outlook is characterized by functional, honest aesthetics and quality craftsmanship. The name Muuto comes from the Finnish word Muutos, meaning new perspectives. The Danish brand pride themselves on paving the way and using new cutting edge materials, techniques and bold creations with help from their handpicked design team. Muuto represents the best in Scandinavian design, sought after worldwide and provide a modern way of living. ﻿Inspired by industrial pendant lights, this quirky redesign is made from a silicon rubber material. This soft friendly aesthetic gives a more versatile look, blending in beautifully with residential and commercial interiors. A variety of fifteen colours to work with and more were added to follow the changing trends. Unfold is a popular and stylish design which stays current with its industrial edge and varied colour pallet. The Tip table is created from the idea of stripping a design down to its essentials. The design is by Jens Fager, one of Sweden’s most interesting young designers. Fager graduated from Stockholm’s KonstfackUniversity and has made his mark on the international design scene with exhibitions in London, Milan and Stockholm. The table light is an example of a simple, functional design with careful attention to detail offering a direct as well as ambient light. Click here to view the Airy Table﻿! The loft chair by designer Thomas Bentzen is inspired by life’s everyday requirements. The chairs design is simple and honest with contrasting materials. Loft’s solid, powder coated steel frame is offset with the warmth of plywood and is a nostalgic nod to industrial design. The visible screws further enhance the engineered feel and the materials provide a functional yet sophisticated chair fitting for any setting. Click here to view the Loft Chair! 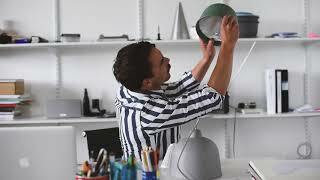 Muuto have recently re-released their incredibly popular E27 pendant now with a LED bulb. The new version features a striking 2W LED naked lamp which like the old halogen version is dimmable. Below shows the available colours of the E27 LED pendant! Click here to view the E27 LED collection! Click here to view the E27 Pendant! In April’s edition of Elle Decoration they feature their second volume of the Essential Kitchen Guide. The kitchen is seen as the heart of the home, a vitial room that’s décor can often be forgotten. The Kitchen guide from Elle Decoration gives you inspiration whether you are planning a full renovation or simply updating a few elements. Below is a collection of lighting which Elle Decoration has picked out to help you create the perfect kitchen. The February issue of Elle Decoration looks at the trends for spring/summer 2017. Editor-in-chief Michelle Ogundehin lifts the lid on what to expect from this years interiors with the idea of the new modern. The idea is reflective of the mood regarding the sate of the nation making our homes a safe place and a personal sanctuary. In conclusion the new modern is a joyful celebration of the home. Instead of playing it safe this is the time to be bold and brave and to show off your individuality. Click on the link to view each of the products above!